In July, 18 students and two members of staff from Darlington’s Queen Elizabeth Sixth Form College will travel to Romania to do voluntary work, helping to build housing in Brasov for the poorest members of the community. Princess Helen of Romania heard of the enterprise and contacted teacher Nancy Wall who is helping to organise the trip. ‘All too often do we read about young people being a nuisance, anti-social or engaging in criminal activity and it is wonderful to read about responsible young people raising the money to engage with a worthwhile cause. Such young people are of course, in the majority, but your students are exceptional. Good community housing in Romania is an urgent necessity and it is something my husband, Alexander has a particular interest in. The students and staff were delighted with the Princess’s letter but, to their surprise, she followed it up by arranging to visit the College on Tuesday June 26, to meet them and to find out more about the project. 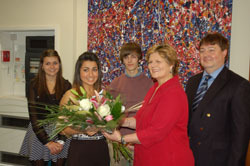 Image attached of HRH Princess Helen and her husband His Excellency Domnul Alexander – with students Jonny Hutton, Anna Morgan and Yasmine Haq.